Americans who don’t know where Ukraine is are more likely to support military intervention — 1389 Blog - Counterjihad! Those Americans who have a basic knowledge of geography and history know that Ukraine directly borders Russia and that the US has no national security interest there. Kievan Rus was the original Russian heartland. With the exception of the extreme western region, Ukraine was part of the Russian Empire before the Soviet Union existed. Those Americans who struggle to correctly point out even the continent Ukraine is located on are more likely to support US military intervention to resolve the crisis and the advancement of US national security interests, a new survey has revealed. A newly published poll, conducted by three Ivy League professors, revealed that only one out of six Americans surveyed could pinpoint where Ukraine actually is on a world map. The survey also showed a worrying correlation in answers – the further the person thought Ukraine is from its actual geographical location, the more likely he or she was to support military intervention in a sovereign state. In their study, conducted between March 28-31, Kyle Dropp of Dartmouth College, Joshua D. Kertzer of Harvard University, and Thomas Zeitzoff of Princeton asked 2,066 Americans where Ukraine was on a map and how they think Washington should respond to the crisis there. The survey was conducted to “see where Americans think Ukraine is and to learn if this knowledge (or lack thereof) is related to their foreign policy views,” the authors explained in a Washington Post blog. 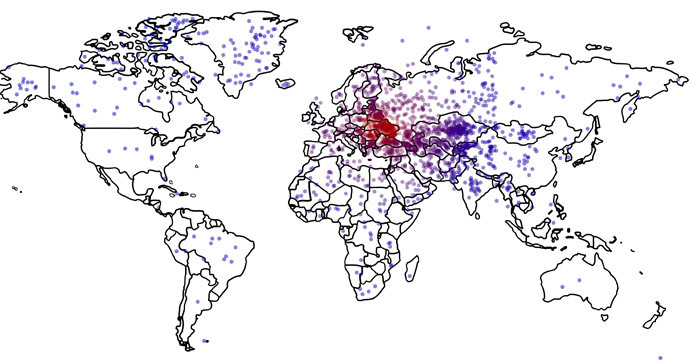 The results, combined in a heat map representing where respondents thought Ukraine was, show that only 16 percent of Americans correctly identified Ukraine on a map, with the median respondent being about 1,800 miles off. Some people thought Ukraine could be located as far south as Argentina or Australia, or as north as Finland. In terms of demographics, the 18- to 24-year-old group provided a more accurate geo-location with 27 percent correctly identifying Ukraine, as compared to 14 percent of the 65+ year-olds group. Gender correlations showed that 20 percent of males were successful at singling out Ukraine, while women had a 13 percent success rate. US servicemen and their families also struggled to locate Ukraine on a map, with only 16.1 percent answering correctly. Non-military households had a 16 percent success rate. Self-identified independents secured the highest rating, with 29 percent correctly locating the Eastern European country. When it came to political association, both Democrats (14 percent correct) and Republicans (15 percent correct) struggled to pinpoint the country. College graduates also failed the geography exam, with only 21 percent answering correctly. Non-college graduates answered correctly 13 percent of the time. “The proportion of college grads who could correctly identify Ukraine is only slightly higher than the proportion of Americans who told Pew that President Obama was Muslim in August 2010,” the authors pointed out. The authors also argue that accuracy in determining the location of Ukraine suggests public opinion predisposition on military foreign involvement abroad. In their assessment, respondents were asked a variety of questions about what they thought about the current situation in Ukraine, and how they would want to see Washington react. “The further our respondents thought that Ukraine was from its actual location, the more they wanted the US to intervene militarily, the greater the threat they saw Russia as posing to US interests, and the more they thought that using force would advance US national security interests,” the researchers concluded. Ignoramuses on the warpath – just what we don’t need.